As a tall, quick seam bowler, it is obvious which homesick, double-Ashes winning bowler Finn is going to be compared to. At 6 ft 7, Finn is able to extract bounce from surfaces where most bowlers struggle to get it above shin high. Marked out as one for the future from an early age, it would appear that injuries and poor form from other England bowlers have meant that “the future” has been shifted from “sometime in 2011” to “this week”. Finn only arrived in Bangladesh as back up for the injured Stuart Broad and Graham Onions, but has impressed the selectors so much by jumping straight off the plane and bowling some hostile spells in the warm up game that he seems to be a shoe-in for the first test. Everything about Finn reads like the classic prodigal fast bowler – he was his counties youngest debutant in over 50 years at 16 and represented England at U16 and U19 level. 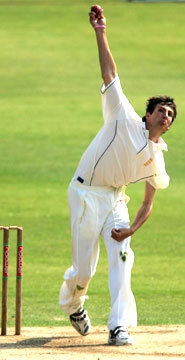 The 2009 season proved to be his breakthrough year, as he picked up 53 wickets at 30 in the Championship. This lead to selection for the Lions winter tour, as well as inclusion in the England provisional T20 World Cup squad. He impressed senior selectors so much on the Lions tour that is now seems only a matter of time before he makes his international bow, be it on Friday or later on in the year. His batting still falls in the rabbit category, with a highest score of 26 and an average of just 6. However, with the depth of batting England currently have, this should not be an issue which hinders his selection. Go Finny! I remember being very impressed by him (and only him, of the pace bowlers) when the U19s were on the telly. He has looked decent the couple of times I have seen him. I had assumed that Woakes was the next one on the list to come through though, looks like Finn has leapfrogged him. I have spent many hours watching Finny with the Middle – God he can be boring! A bowler who brings home the 5fers in English conditions he aint. I just hope he becomes some kind of daemon bowler in the way most batsmen seem to become just the opposite kind of batsmen when being picked for England – if that happens. 1 career 5 wicket haul isn’t it? The fact that they have picked him ahead of Tredwell suggests that England want to “have a look” – obviously when Onions and Anderson are fit, you would assume he will slide down the pecking order again whatever happens in the next couple of weeks.